I am the magic man. I am your link to the subconscious. I have what you want. I can get you what you can't have. With this Strange Days post, 10 years on and to the minute, we close the curtains on our Single Take Titles series. There is something about the power of single-take shots, Steadicam or otherwise, wherever they fall in a movie's timeline. 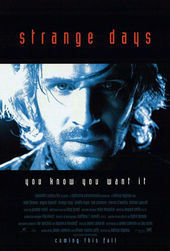 Contextually, from a November 1995 issue of American Cinematographer, "...richly textured and technologically groundbreaking...Strange Days [is] a noirish thriller that unfurls almost exclusively in the post-meridian hours...set on the eve of the millennium...tracks the dubious activities of a gang of fringe operators who dabble in a new kind of narcotic: 'sensory recordings' (SR)." Executive Producer/Screenwriter James Cameron says he imagines SR as a futuristic offshoot of law enforcement technology, a "next-generation wire-tap."